It is April, which means spring is springing and it is time to get our hands in some Southwest soil! SW Community Gardens is excited to host its 6th Annual Spring Kick-off Event on April 20, from 11 a.m.-3 p.m. in Lansburgh Park at 1098 Delaware Ave., SW. If you did not already know, Southwest’s only community garden is located in Lansburgh Park. A group of neighbors committed to bringing communal gardening to Southwest established the garden in 2013. The garden is composed of two sections: one for individual plot owners and a communal section open to anyone during the garden’s regular work days, which are Wednesdays 6-7 p.m., and Sundays 4-6 p.m. Throughout the gardening season, there is planting, cooking demonstrations, composting, painting, hanging out, and of course, weddings, which no garden can go without! The Spring Kick-off represents the garden’s opening for the year, and the beginning of the regular work days. In previous years, there were a variety of workshops, planting, and conducting of art projects, all with funky-good tunes playing in the background. 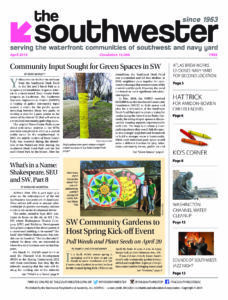 Last year, SW Community Gardens won the first micro-grant from Pocket Change, sponsored by the Southwest Neighborhood Assembly and the Southwest Business Improvement District to transform the kick-off into the SW Earth, Arts and Music Day. 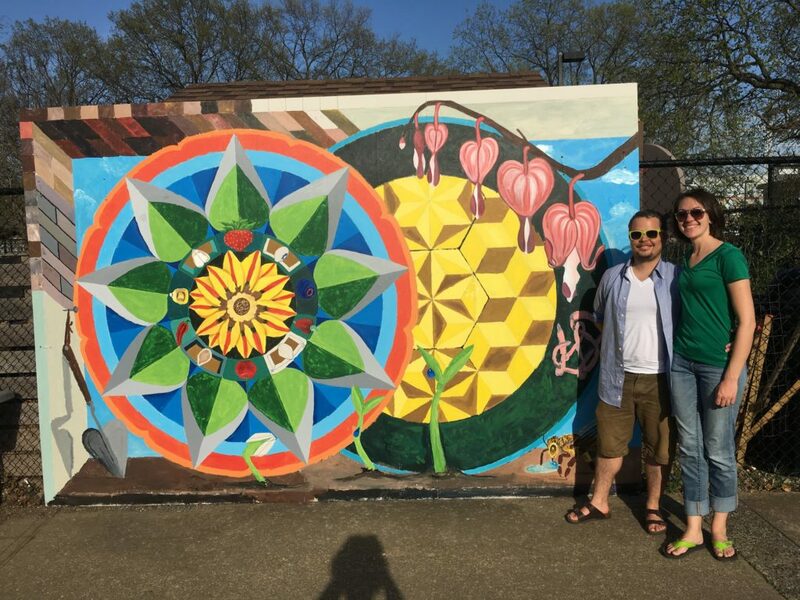 Muralist Eric B. Ricks (@versatilevice) facilitated a garden-themed paint-by-the number mural that sits outside the garden now. Following that, Carly Harvey’s Kiss & Ride band (@carlyhmusic) performed some funky, bluesy numbers to soothe the soul. This year, among other activities, the kick-off will feature a compost workshop, planting the communal beds and art activities facilitated by Southwest’s own Chris Williams, better known as @crazyuncledc (you may have seen him at the SW Farmers Markets or during the Friday Night Markets). For more information, get in touch with the organizers via Facebook (facebook.com/swgardens), Twitter (@swgardens), Instagram (@swgardensdc) or the website (swgardens.org). It will be a great time and we hope to see you there!